Verdict: Sony is one of the most recognized consumer electronics brands on the planet. Their headphone line ranges from inexpensive everyday headphones to top of the line noise cancelling headphones with premium sound. 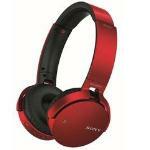 One of Sony's latest creations is the MDR-XB650BT headphone. Verdict: I listen to a lot of podcasts and music at the day job. I've been using the same wired earbuds for years but my recent purchase of a Moto Z has led me to reevaluate things. Of course, I could just continue using the same earbuds with a 3.5mm>USB-C adapter but what's the fun in that? Verdict: The MDR series of Sony has been well respected and it's general term – "Music Deserves Respect" has been famous due to the introduction of the MDR-1R. Today we have the Sony MDR-XB650BT – Bluetooth Headset which Sony hopes to entice the average consumer with wireless listening and comfort. Verdict: For those that love bass, not just any headphones will do. These lovers of bass would want to hear something like a subwoofer when wearing headphones, and the Sony EXTRA BASS lineup would suit you just fine. Verdict: Comfortable, good audio, great battery life, and no wires – this is the ideal travel companion for when you need your music fix on the go. Verdict: Not a lot of good options are available when I go out looking for some branded, good looking wireless headphones. When Sony MDR-XB650BT arrived for review I said to myself – if these sound good, their overnight success is guaranteed!